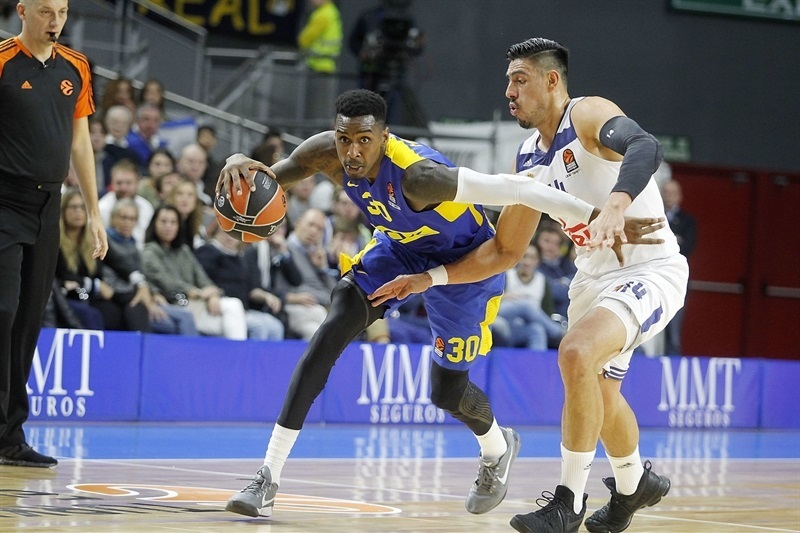 In a European basketball classic, Real Madrid grabbed its third consecutive win by downing Maccabi FOX Tel Aviv 80-75 in the Spanish capital on Friday. 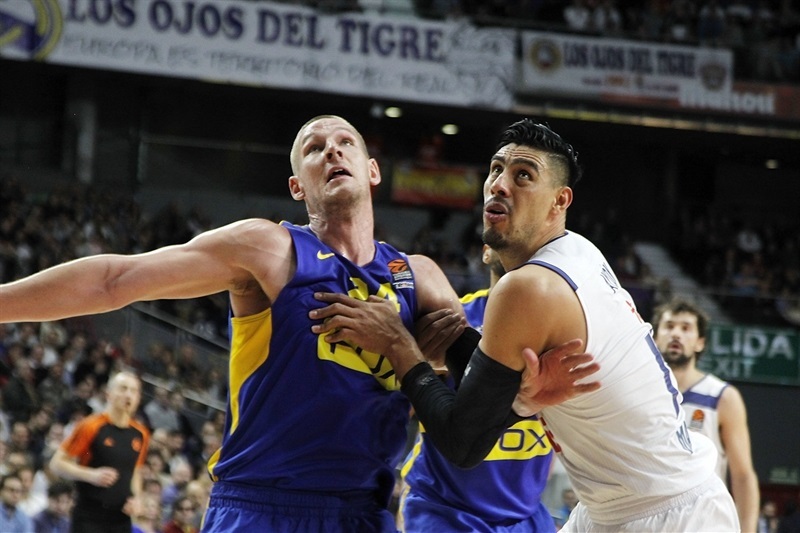 Madrid improved to 12-5, while Maccabi dropped to 6-11, three wins away from the playoff zone. 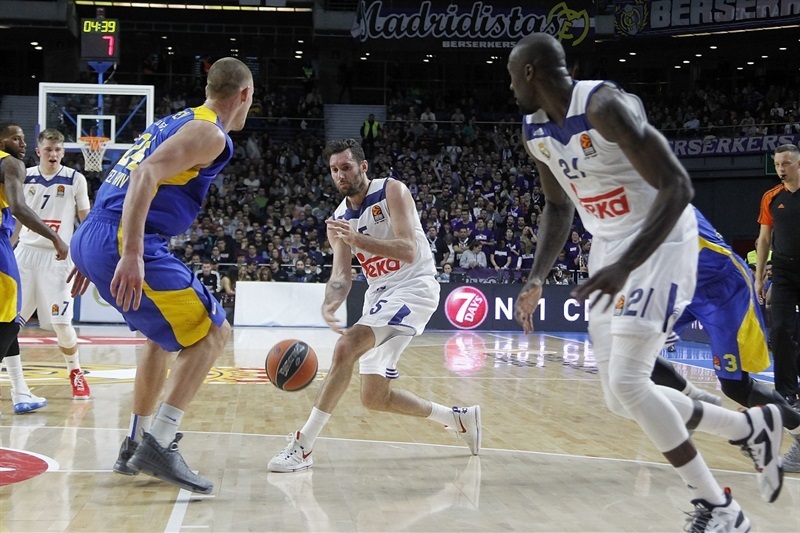 Rudy Fernandez and Gustavo Ayon led the winners with 14 points apiece, Sergio Llull added 13 while Luka Doncic had 10 points, 11 rebounds and 8 assists for Madrid. 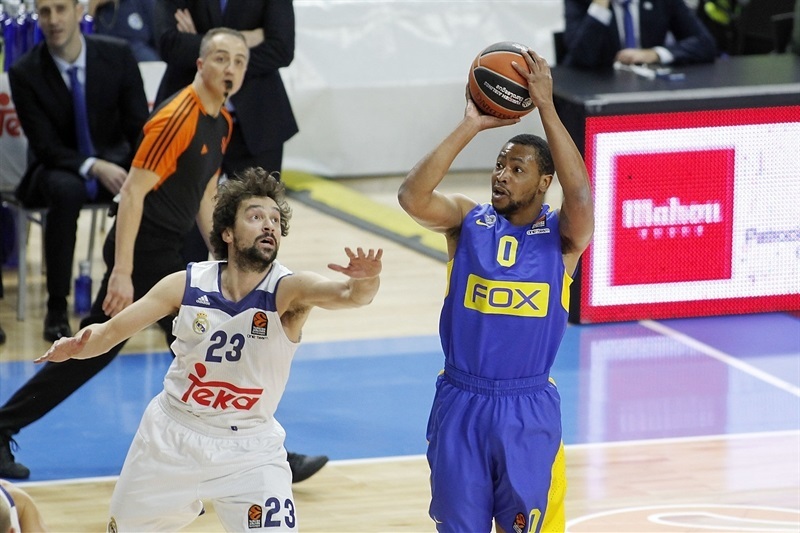 Victor Rudd and Andrew Goudelock led Maccabi with 18 points each. Quincy Miller added 14 for the guests. 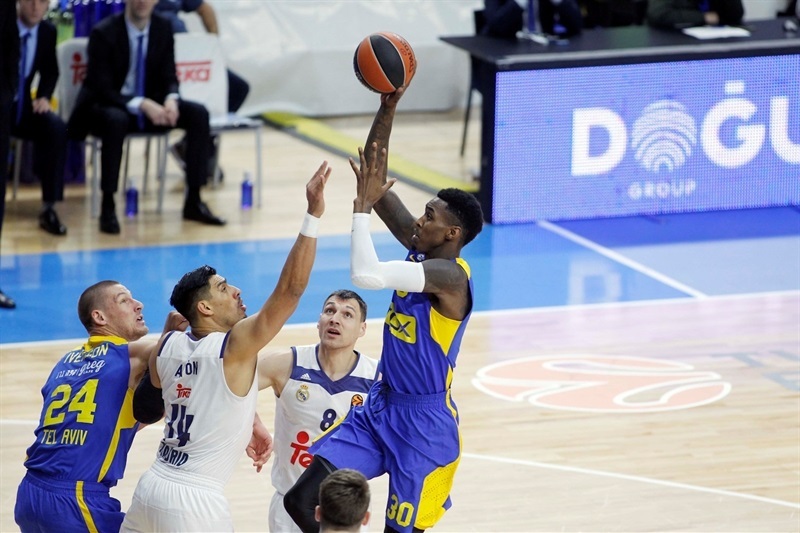 Despite committing 10 turnovers and making just 10-of-28 two-point shots (35.7%), Maccabi pulled down 10 offensive rebounds and held Madrid to low shooting percentages (29.4%, 5 of 17) from beyond the arc to stay within 37-36 at the break. Maccabi ended up outrebounding Madrid 32-37, but finished with 18 turnovers and ended up making only 19 of 43 two-point shots (44.2%). Madrid dished twice as many assists as Maccabi, 22-11, and had only 10 turnovers in what was one of the biggest keys to this exciting game. Felipe Reyes got Madrid going with a fast break layup and Doncic added a triple for a 5-0 lead. 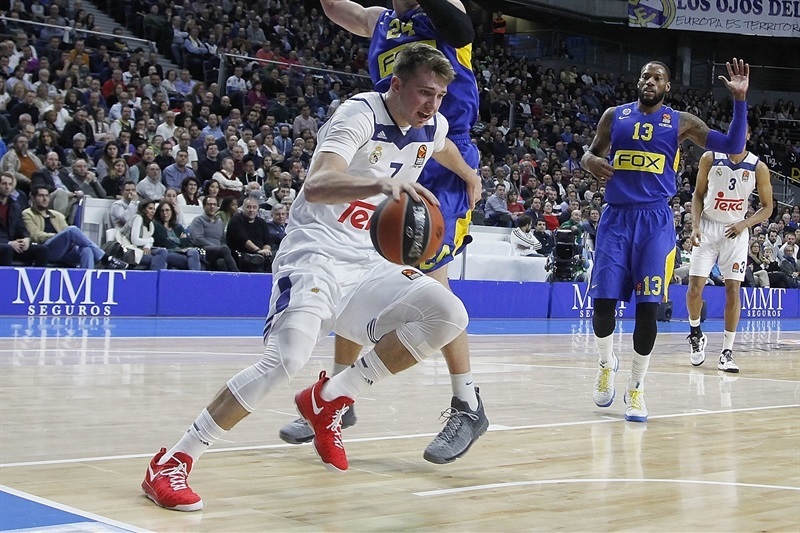 Goudelock followed a three-pointer with a jumper, but Ayon and Reyes kept Madrid ahead, 9-7. 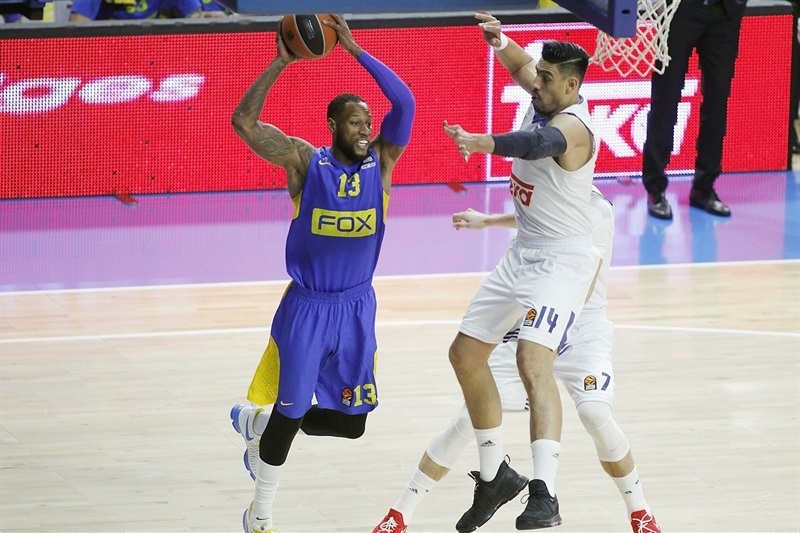 Anthony Randolph struck from downtown, but Goudelock kept pacing Maccabi, scoring the opening 5 points in a 0-11 run that Miller capped with a jump hook that prompted Madrid to call timeout at 12-18. Jaycee Carroll made free throws and Othello Hunter added a tip-in, but an off-balance, buzzer-beating triple by Devin Smith gave Maccabi a 16-21 lead after 10 minutes. Fernandez hit one from beyond the arc to ignite a 7-0 run, which he capped with a driving layup for a 23-21 Madrid edge. Miller hit a triple, Maik Zirbes added a tip-in and a three-point play by Rudd gave Maccabi a 25-29 margin. 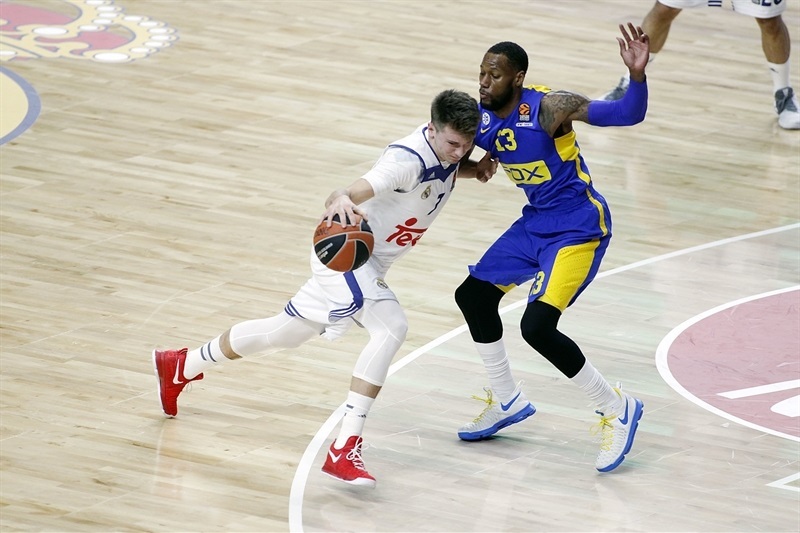 Doncic and Fernandez tried to change things for Madrid and Randolph buried a three-pointer for a 35-32 Madrid lead. Sonny Weems and Colton Iverson kept Maccabi within 37-36 at halftime. Iverson hit a jump hook, as Goudelock briefly left the game with a leg injury. Three-pointers by Miller and Rudd soon boosted Maccabi's margin to 39-46. Reyes and Llull tried to change things for Madrid, but a couple of driving layups by Yogev Ohayon and free throws by Rudd made it a double-digit game, 43-53. Ayon scored twice around the basket and three-pointers by Llull and Trey Thompkins brought Madrid within 53-56 after 30 minutes. Smith and Goudelock joined the three-point shootout early in the fourth quarter for a 55-62 Maccabi lead. 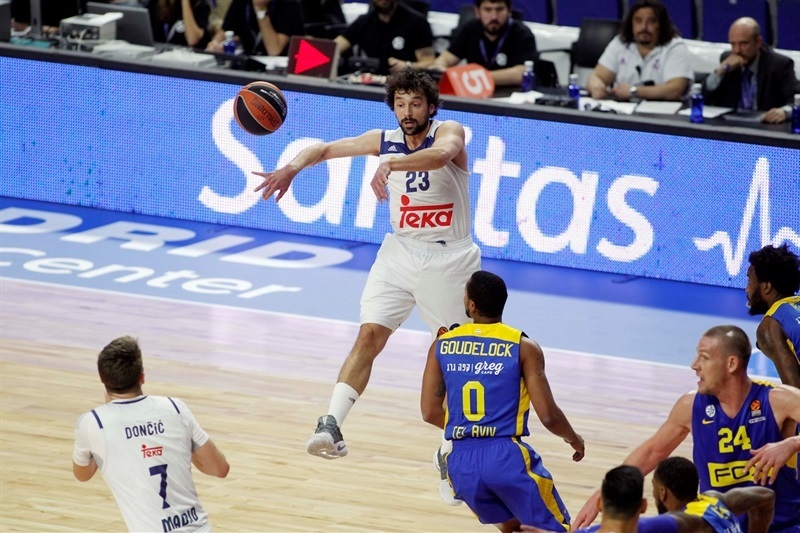 Ayon followed a dunk with a layup and even though Miller stepped up with consecutive layups, Llull kept Madrid within 64-66 with seven minutes left. Llull buried another triple that Rudd matched with a layup-plus-foul. 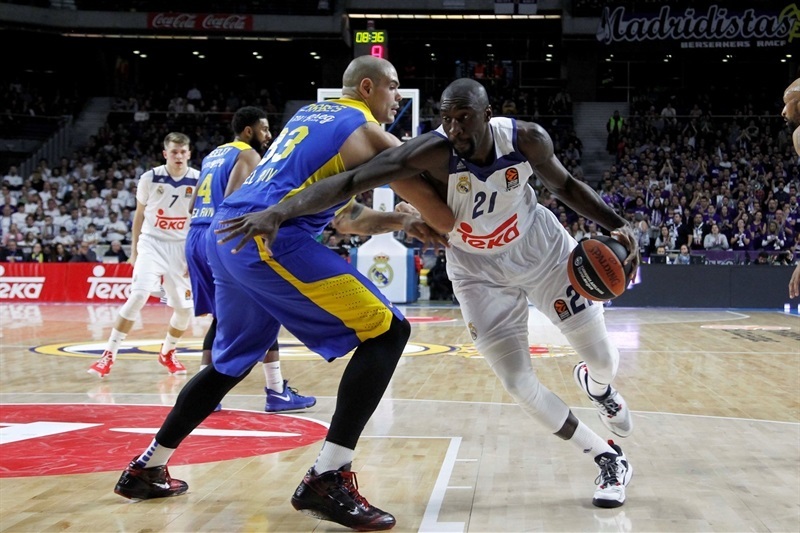 A dunk by Hunter and a three-pointer by Fernandez restored a 73-71 Madrid lead. Maccabi struggled to score when it mattered most and a floater by Carroll and a layup by Thompkins sealed the outcome in the final minute. "First of all, congratulations to my players for the victory. I am very happy for many reasons. I believe it was a very difficult game: they changed the way they were playing, with a bigger team trying to stop the game pace. We didn't find the right way to stop this in the first half and didn't rebound the ball in the first quarter. We missed some shots and were a little bit cold, I believe. Little by little, we increased our intensity, especially on defense, and that allowed us to have a better balance of assists and turnovers, which I believe was key to win. In the end, it was quite a close game. We knew about how dangerous Maccabi is, with good one-on-one players, able to hit tough shots. Not giving up is something we must have and we showed it today. We recovered little by little. We were able to turn the game around at the end of the third quarter, never surrendered and kept fighting knowing we would get back in the game, which is was happened. 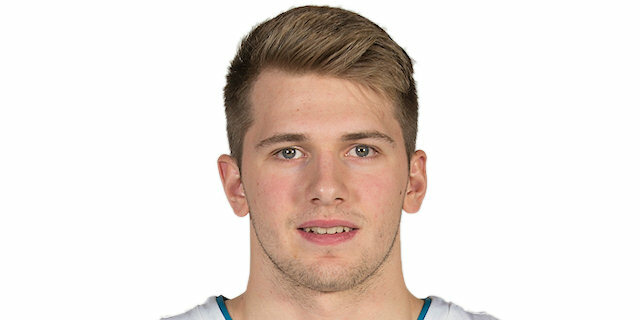 Luka Doncic is 17 years old and almost got a triple double, so he played a great game, of course. He helped us in many aspects of the game and his numbers were brilliant today. I don't know if it was his best game but in general, he played really well. I would highlight his 11 rebounds, because Maccabi played with a big lineup. He was able to rebound from the outside, the most positive thing he did in this game." "It was a good game, an interesting game for everybody. Of course, we are sad that we lost. We were in the game for 35 minutes and the goal of our execution before the game was stopping Madrid's three-point shots, because it is one of the best three-point shooting teams in Europe. We almost did that. Our second goal, after three-point shots, was getting rebounds and we almost did it because Madrid, again, is one of the best teams at that in the EuroLeague. Our third one was stopping their transition offense, especially through LLull and again, their transition game is one of the best in the EuroLeague. Generally, we did all these three things and from our side, we tried to force the offense in a way that we didn't make turnovers, but that didn't work. We made 19 turnovers and Madrid got a lot of easy points. Generally, that is the reason why Real won this game - our turnovers." "We had to work really hard for this win because Maccabi has unbelievable players and are a dangerous team. The most important thing is that we won tonight, but I am also very happy with my stats. When I was younger, I saw it would be very impressive to play in the EuroLeague and I am very happy now. Rudy Fernandez played a very important role. All players are important for this team, but Rudy and Sergio Llull did really well in the second half. When we down by 10, Coach told us to play tougher because we were not plaing very good defense, and this is what we did. 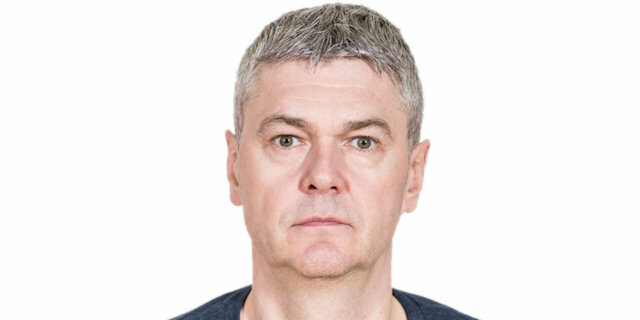 We all want to win the EuroLeague, to tell you the truth. It is important to win all home games because it is very important to finish the regular season in the top four to get the home court advantage in the playoffs. When I turn 18, first, what I want is a driving license! Just kidding. Being EuroLeague champion, my dream as a little kid, but also the Copa del Rey and the Spanish League."